West Virginia’s “Wild, and Wonderful” mountains host TWO of America’s best and most popular West Virginia whitewater rafting rivers…the New and the Gauley. Surrounded on three sides by the New River Gorge National River Park. Close to the Gauley River Corridor, you’ll find the finest selection of exciting rafting whitewater adventures available anywhere in the country! From easy, family-friendly “mildwater” rafting to the biggest and most exciting world-class whitewater. As a result the New and Gauley rivers can be run in the Spring, Summer and Fall. Therefore each season brings its own unique selection of rafting adventure in West Virginia. Paddle America’s oldest river canyon, that has been designated a National Treasure administered by the National Park Service (NPS). Over 20 legendary bigwater rapids await you on the Lower New. Huge spring water for the fearless, summer’s refreshing roller-coaster waves for the family, and a burst of fall color for everyone means the Lower New has something for everyone! Beginner-friendly whitewater rapids make this the perfect trip for laid-back adventure in the great outdoors. You’ll raft through a magnificent 1,400-foot canyon and enjoy some of the East’s most spectacular scenery. The Upper New River is unique in its geology. The river formed over 300 million years ago. This section of river offers our mildest guided trips. Consequently learn about local history, play games, and enjoy a great riverside lunch. Above all, skilled professionals guide every trip. Boiling up from the depths of Summersville Lake for 22 days during September and October comes Fall Gauley Season. The palpable energy of the legendary Gauley River lures thousands of whitewater rafting enthusiasts from around the world every year. You’ll never feel more charged or more triumphant than when you have conquered the most adrenaline-packed day of rafting found in all of North America! With its sheer cliffs and rhododendron-lined banks, the Lower Gauley River is the state’s most beautiful river…and Class V too! 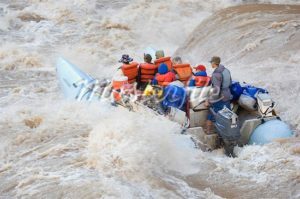 This section’s 14 action-packed miles feature towering waves and raft-munching holes…including three Class V rapids. We recommend the Lower Gauley to both first-time rafters and experienced paddlers. As a result it’s less intimidating than the Upper Gauley, but every bit as much fun.